I didn’t click pictures while I was making it 😦 so I’ll just verbally recount the important steps. 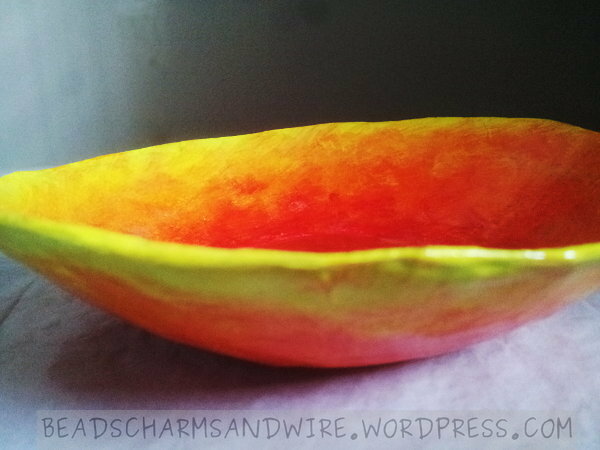 I first selected a plastic bowl as the base to use in shaping the tray. I then prepared a flour-based glue. For the paper, I tore up newspapers randomly. Hand-torn is preferred (instead of clean-cut) because it helps the pieces form a more seamless surface. Then came the construction of the tray — this took a while because the paper pieces need to be stuck in multiple layers, and every layer has to dry out before the next layer can be worked on. For the first layer, I spread some paper glue on the base surface and stuck a paper piece on it, brushing some glue on it. Then another piece followed by a coating of glue, then another piece and so on. When the layer was done, I set it outside for air-drying. Another layer followed, then another, until the structure was strong enough to independently hold its shape — that is, without the plastic bowl base — while I work on the next layer over it. At this point, I removed the plastic bowl; it came off pretty easily after the first few nudges at its rim. More layers followed, both on the inner surface and the outer, until the tray was thick enough. I finally made the rim neater (but still kinda uneven — I liked how the uneven rim looked) by adding folded strips over it. That was the paper base done. I then borrowed my sister’s gesso to prime the bowl for painting. 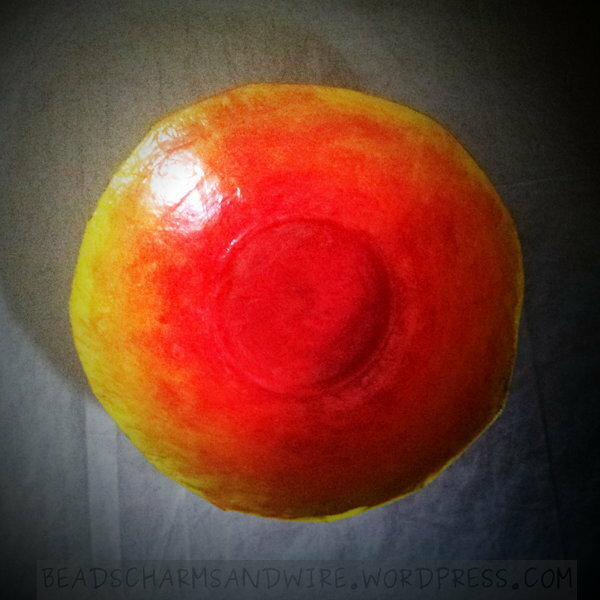 After letting the gesso-coated tray dry, I painted it a rough, uneven gradient of yellow, orange and red acrylic colors. Finally went a couple of coatings of Mod Podge to give it a nice finish. 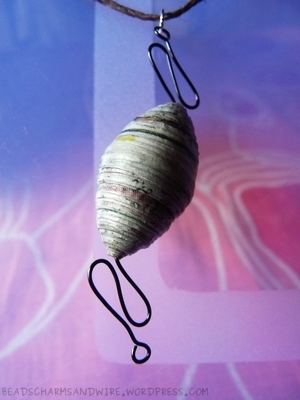 These earrings are one of my early jewelry-making experiments. I made these from some wrapping paper (I think.) They have absolutely no varnish on them, and are suited only for dry days. This is an old project of mine — a bracelet using wire crochet and beads that I made during my early days of discovering wire crochet. It scrunches up a bit if you apply light pressure on it, so you’re safe even if it is slightly bigger than you intended. 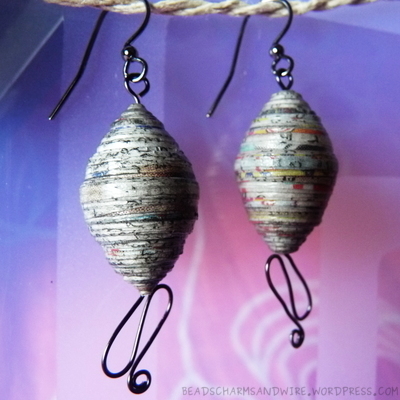 I’d just made a few paper beads of varying sizes and shapes (ranging from spherical to thick-saucer) from the same paper, and was looking for ways to incorporate all of them in a jewelry piece. And well, I did want to try out more wire crochet… 🙂 That’s how this project came about. I used three different colors of 26-gauge wire for this bracelet. I cut 5 pieces of wire, each about 24″ (60cm.) I didn’t need to string the beads onto the wires before I started, because the wires are short and beads can be added when needed. (Yay for that!) I divided the beads into three piles, and made chain stitches on three of the wires, adding the beads now and then to the stitches. I made plain chain stitches (with no beads) on the other two wires. I lightly twisted each plain chain with one each of the embellished ones, so there were 3 chains overall. I then wove those into a 3-strand braid. I finally secured both ends and added a clasp. That was easy, wasn’t it? Let me know if you try it out sometime! My new sideboard arrived recently, and my room finally has some proper furniture in it. Rearranging my stash inevitably followed, and in the process, I found some old one-sided printouts that I’d retained to repurpose as jewelry. So I got to work. I cut out eight 1″-wide squares from the paper, and then divided them into two equal piles. I glued together the 4 squares in each pile to make 2 strong squares. (Err, or at least stronger than the individual ones…) I applied my scissors to two opposing points of each square and made them curved. I then used a sharp pin to make a small hole on each square near one of the uncut points. I would use these holes to attach the earring findings later. I painted a curved gradient on each square using black and dark-blue watercolors. For added effect, I diluted the blue paint on my brush and gently nudged it along, and just outside, the boundary of the curve. That gave it a blot-like look. I repeated the process on the other surface of the squares, ensuring that the same point is used for the start of the gradient on both sides. I also took care to color the edges of the pieces so the white of the paper doesn’t show up there. Even after all this, the pieces looked a bit plain, so I borrowed my sister’s Signo white pen and drew some waves and curves on them. Much better! Alright, it was time for some gloss! I applied two coats of Mod Podge with a satin-finish on the pieces, each coat applied after the previous had finished drying. (The satin finish is quite glossy. I’d expected a light sheen, but nope, the shine almost blinded me. 😉 ) I then attached a large jump ring each through the holes, and finally added earring findings to the jump rings. Happiness! 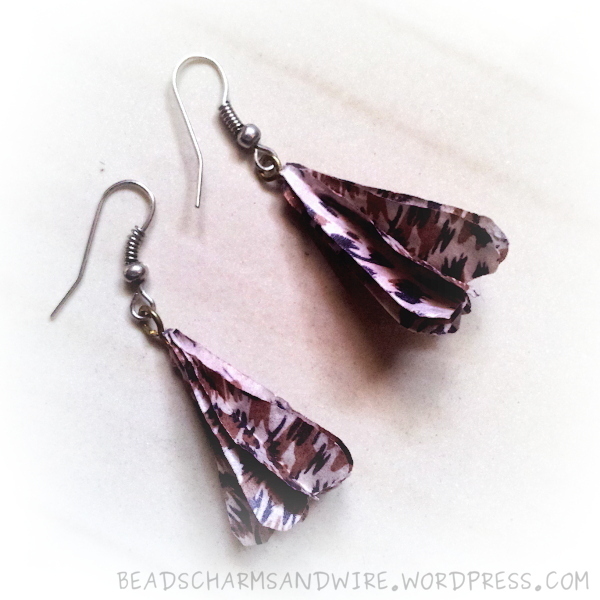 So, do you like flat paper earrings like these? The wire jig has finally been conquered! Okay, maybe ‘conquered’ is a strong word. What I can say for sure, though, is that the shapes I make using my wire jig resemble one another much, much more than they did earlier. More importantly, they resemble the shape that I want them to be. I’m pretty pleased with the earrings and pendant that I created using my wire jig and some chunky newspaper beads that I made earlier. I started the earrings by first making the bottom spiral using my round nose pliers. I used the spiral as the initial anchor to hold the wire while I wound it around pegs on the wire jig. After making the S-shape, I used my chain nose pliers to remove the curves at the point where the S-shape ended. 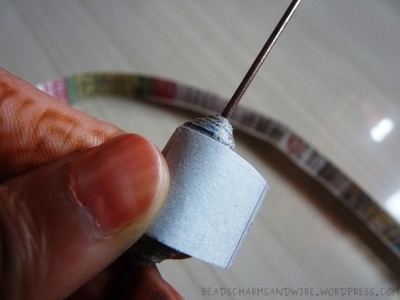 I then threaded the paper bead onto the wire, and made an eye loop at the top. I took care to duplicate each step for both earrings before moving to the next step; that way, I could make sure that both shapes resembled each other better. As the last step, I attached the eye loop to an earring finding. I wanted the pendant to be a bit unique. I thought it would be nice if the pendant could be attached to its chain either vertically or horizontally. 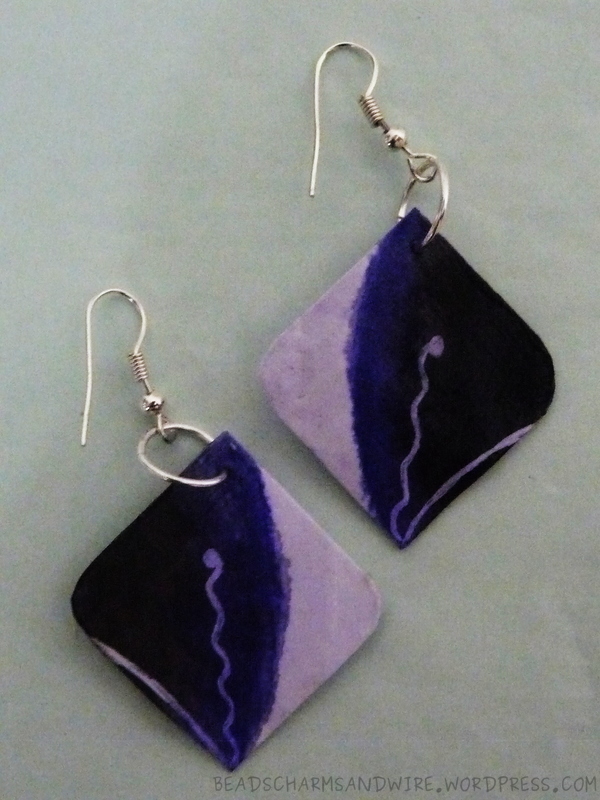 Of course, I wanted the S-shape in the earrings to be present in the pendant too. So well, this time, instead of a spiral, I made an eye loop and used it as the initial anchor to bend the wire in the S-shape. 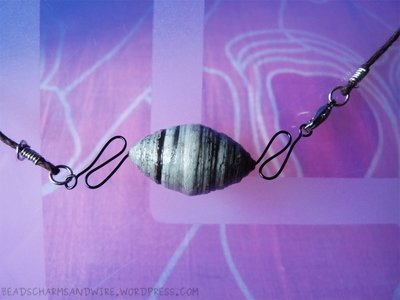 I strung the super-chunky bead on the wire, and made another S-shape. It was a bit difficult to wind wire on the jig with a chunky bead trailing behind, but I managed it. Another eye loop came last. I made sure the shapes at both ends were roughly of the same size. 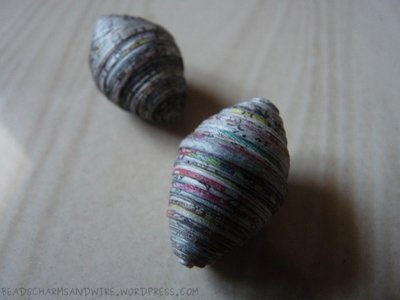 Paper beads were what I started my DIY jewelry experiments with, and Janice Mae’s paper bead blog and video tutorials helped me take my first (and many subsequent) steps in making paper beads. I’m so grateful to her. Now for the chunky beads. I’d decided to make them from newspaper. 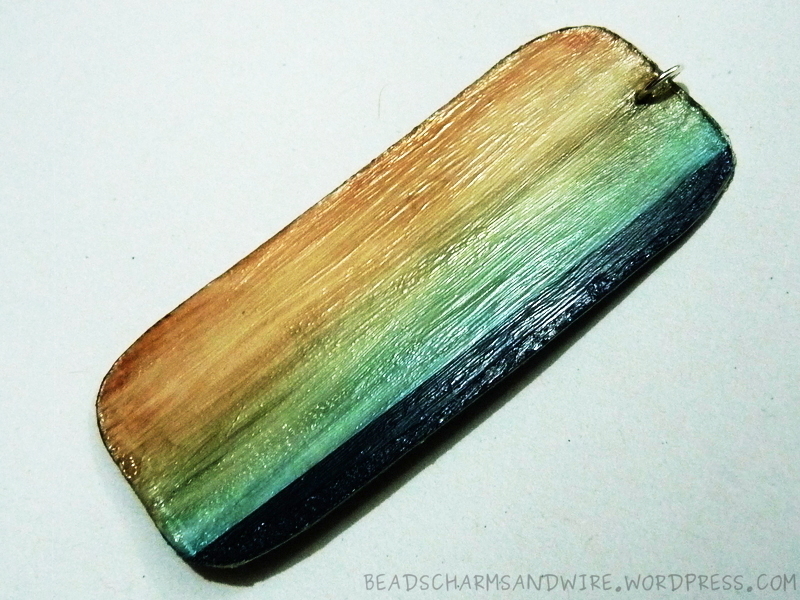 I’ve made such beads before, and used (and then reused) them in jewelry pieces. Now that my sister has finally added them to some bracelets, I thought I’d make another set. Chunky beads look great when used with wire, but I’ve not really decided how exactly to wire-embellish the ones I’ll make. I’ll leave that inspiration to strike me another day. 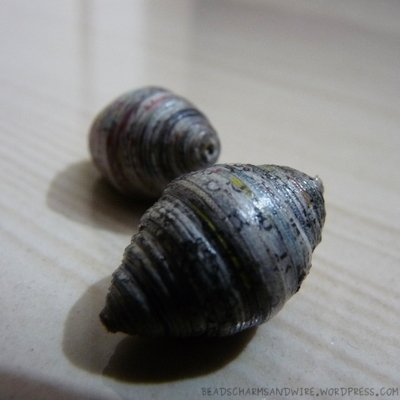 Meanwhile, I’ll summarize how I made the beads themselves. I followed most of this tutorial by Janice Mae for the beads, except that I wanted my beads to be chunkier than the ones in the tutorial. Because I used thin newspaper instead of the thicker catalog paper used there, I had to measure and cut many, many long strips of newspaper. Each strip was about a meter long, with the ends of the strip differing in width by half a centimeter. 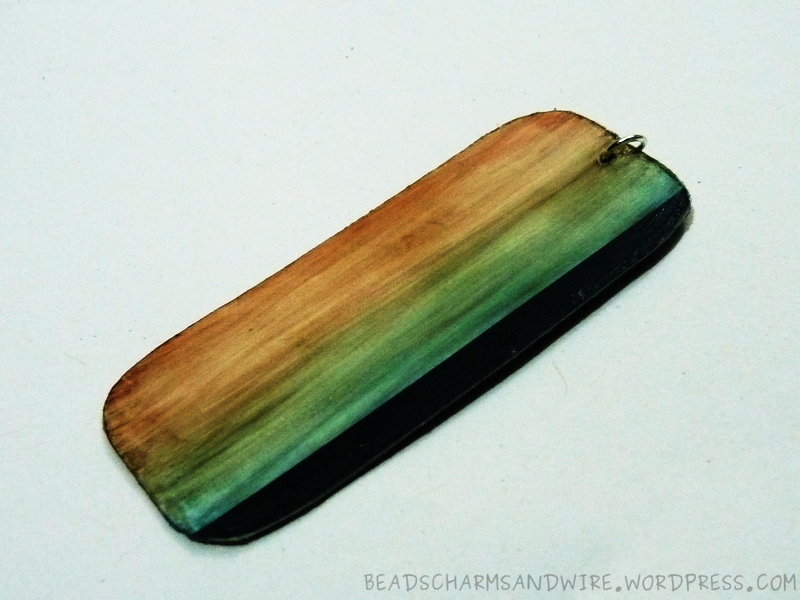 The long strips made it a little clumsier to work the bead — if I was not careful, my fingers would slip, the paper would get unwound, and I had to do damage control. That’s why I had to use glue frequently to keep the paper in place. 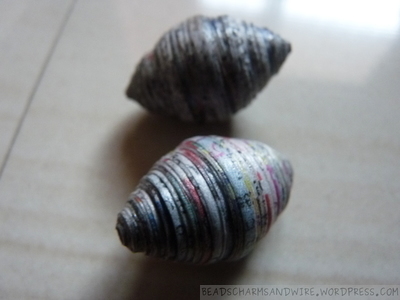 After lots of paper-winding that included gentle pushes on the surface of the beads to shape them, the chunky beads had passed the first stage of their creation. I left them for a while so the glue could dry. Over the next few days, I applied multiple coats of matte-type Mod Podge on the beads, leaving each coat to dry well before the next application. The beads are now hard, with a bit of shine on them.